In addition, “VEC® Composite Technology computers control more than 500 complex variables that reduce styrene emissions by up to 90%. In fact, the process is so environmentally friendly that VEC® was awarded the prestigious Clean Air Excellence Award from the Environmental Protection Agency.” To overly simplify, VEC® Technology (Virtual Engineered Composites) involves the injection of the liquefied composites into a closed mold, curing it at temperature, opening the mold and removing the part – be that a hull, possibly complete with stringer support system, a deck, or a part as small as a hatch cover. The LSR 2300 is certainly designed for family watersports with the bottom extended section of a two level integrated swim platform right at the water level, the most ideal location for maximizing watersports enjoyment. A grey mat covering is standard equipment on both levels of this platform providing cool comfort and grip. A recessed 3-step boarding ladder and hand rail is included with a stainless steel ski tow ring mounted on the centre of the transom. A flip-up section of the double-wide stern sunpad over the motorbox allows easy walking access from the upper level of the swim platform through to the cockpit. A removable cushion on the starboard side of the full width contoured stern bench seat prevents stepping on this seat cushion when so accessing the cockpit. A full fibreglass cockpit liner includes standard grey snap-in cockpit carpet. An open storage compartment with retainer netting is found under the centre and port portions of this stern bench. Likewise, open pocket storage with retainer netting is found on both the port and starboard sides of the cockpit. “Sport” bucket seats with swivel and sliders are provided for the driver and helm passenger with a flip-up bolster on the driver’s bucket. Both driver and passenger helm consoles feature stainless steel accent panels and vinyl wrapped “eyebrows”. Tilt steering is provided at the driver’s helm facing a standard three gauge cluster – two larger multiple three instrument gauges on the outside flanking a smaller centre temperature gauge. DC rocker-type control switches are pleasingly and ergonomically stacked on each side of the gauge cluster. Pocket netting storage is found below both consoles and a glove box within the passenger console. 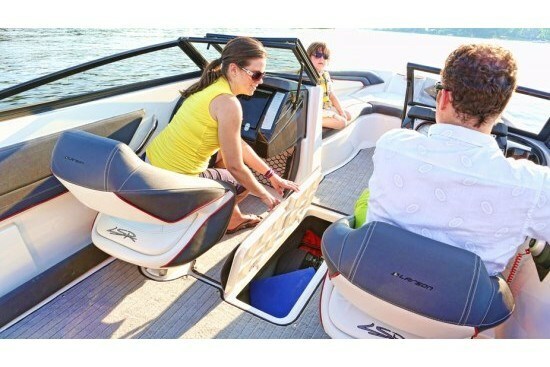 An in-floor watersports accessory storage compartment is located between the helm buckets. A centre-opening low profile smoked windshield with side glass sections adds to the sporty character of the LSR 2300. 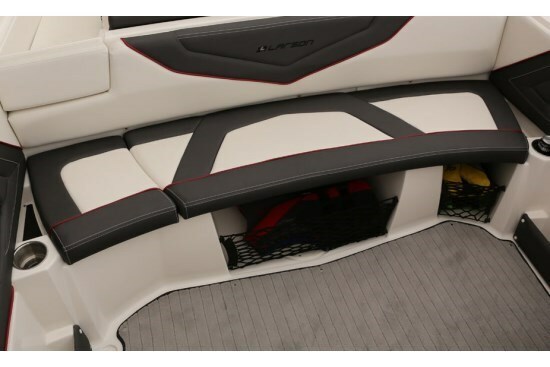 Contoured bow seating with padded backrests and side coaming panels offer molded fibreglass storage compartments below the cushions. 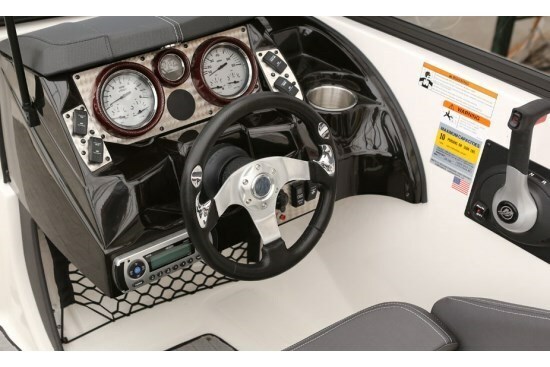 Stainless steel cupholders are provided throughout the boat. An AM/FM stereo with two speakers plus MP3/iPod ports is standard as is blue courtesy lighting. A custom colour matched tandem axle trailer with swing tongue, chrome wheels, and diamond plated fenders is also standard equipment. 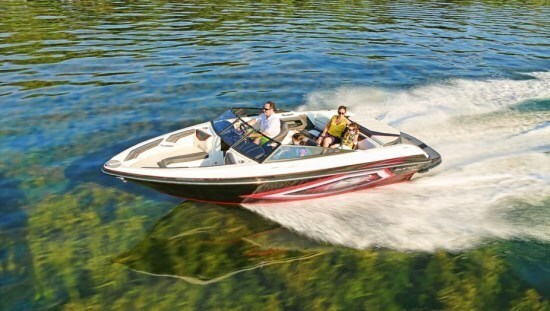 Notable factory options include a wakeboard tower with racks, various bimini and canvas covering options, a tall clear windshield with side glass instead of the low profile tinted sporty standard windshield, bow filler cushion, a unique flip-up rumble seat with walk-thru pad, U-shaped cockpit seating with table, premium sound system, and high-back bucket seats with armrests for driver and passenger. 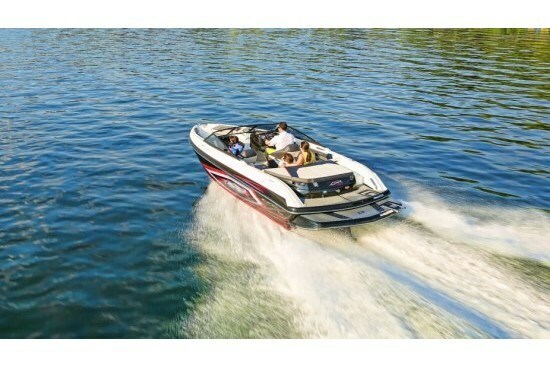 Power options from MerCruiser range from a 220 horsepower 4.3 MPI up to a 300 horsepower 350 Mag MPI with Bravo III outdrive are available. 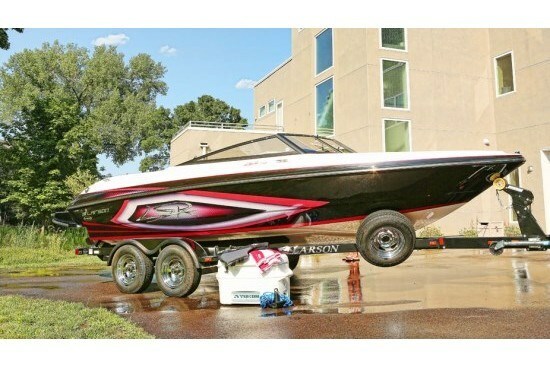 Larson touts its LSR 2300 as “Family fun on the water,” and it would certainly appear to fill that bill very appropriately.